1. Initialize the classification layer and the last layer of each residual branch to 0. 2. Initialize every other layer using a standard method (e.g., Kaiming He), and scale only the weight layers inside residual branches by ... .
3. 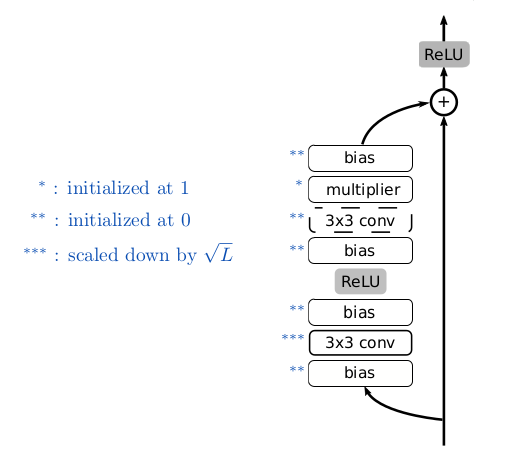 Add a scalar multiplier (initialized at 1) in every branch and a scalar bias (initialized at 0) before each convolution, linear, and element-wise activation layer. I used to think that zero init is a pitfall. What am I missing? In a convolutional neural network (CNN), when convolving the image, is the operation used the dot product or the sum of element-wise multiplication?